Prachee Adhikari is an Indian actress working in the South Indian Film Industry. Before starting her career as an actress, she has worked as a Product Model and has appeared in couple of Music video. The very next day after the photo shoot she got a call from Doordarshan for a social cause documentary & advertisement’. 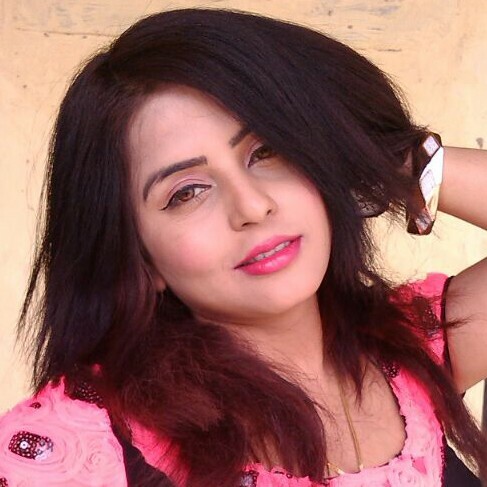 She has done couple of albums for T-Series in Hindi, Punjabi & Bhojpuri under the direction of Padam Gurang. In Telugu she did “Swasa” in Hemchandra song “Samyam”. Prachee made her movie debut in S.R.Production’s Women Oriented Telugu Film Doshi opposite Ali. I was born on 16th March in Haldwani in Uttaranchal. I was a brate, naughty and grew up as a tom boyish girl and full of life. 2 : What you have done in Education ? I’ve done graduation In Organizational Behavior and mastered In International Marketing MBA from Spanish Business Institute UBI Rank 17th Business School In the world. 3: Who inspired you to become an Actress ? I Met with Mr.Vinod Zutsi who directed Ali Baba Chalish Chor and many old Hindi movies. He said I have resemblance of Juhi Chawla and offered me a photo shoot and I said him I would enter into the field only If I would be confident about my photos and the photo shoot came awesome and this is how I entered into the film industry. 4 : Your first experience in front of camera. My first experience with camera was when I was shooting for a Doordarshan Programe “DOPEHAR AAKHO DEKHI. I did anchoring for some days on it on the social cause. I was nervous in the start but gradually started backing up with the confidence and loved the camera. 5 : Have you learnt dance and acting before coming in Acting field ? I’ve not taken any formal training in dance and acting but I did some theater before because there was a passion of acting inside me. I am a free style dancer but easy with choreographer, Everyday we learn something and I believe in it. 6 : Which was your first movie as an Actress ? My first Telugu Movie was Doshi ( released in 2008) with South Indian comedian Ali. Suman Shetty, Rami Reddy, Narshing Yadav were my co stars in this film. I played the main lead, my character name was Aruna. It was a hit and being a new comer critics appreciated the act of mine in the film. 7: Film is a world of glamour and beauty do you think that exposure is helpful for an Actress ? Glamour is for one who can sustain it for long and do not jump into conclusion with one’s success or one’s failure about themselves and I am a girl believe in long run horses than running and jumping too fast. Exposure is important when the script demands it, you cannot wear a bikini in a temple scene and in the same way a sari in a swim scene. You have to choose between the lines and have to generate sense of understanding where you are going and in what direction. 8 : What type of roles you aspire to do as an Actress ? I have no problem doing a glamours or modern role, I can even love to be the next Sharon Stone Of Hollywood Blockbuster “The Basic Instinct”. I would love to play James Bond Girl role or over romantic or a girl with mental illness, a psycho, a complete village woman. Roles which brings too much challenges & learning and something unusual than regular. 9 : What qualities of South Indian movies you like best ? South Indian movies are live in life. But some of the Tamil directors are going to off beat cinema like Hollywood style, detailing every small thing from a foot print to showcasing the wounds on the face. I like the new talent coming in the industry especially in the direction field. I can only pray if I get to work with good experienced directors like Mani Ratnam or new talents with scientific style. 10 : What are your future plans as an Actress ? I as an actress plan on grabbing as much as good work I can do, where I can live my role and do something to make my director and producer and his whole team proud working with me with my work and do advertisements to the products I like relate with easily. 11 : What is the difference between Hindi movies and South Indian movies ? Hindi movies where focus on both International and national audiences and keep an eye on reality based or commercial based story in the movie and highlight the glam and reality together to reach to Cannes Film Festival or Oscar, same time Southern Film Industry focuses on the regional audiences rather focusing on dance drama, the southern directors want first the public and mass audiences to like the movies of the director than the outsider but on same time both industries are inter related and when the South and Hindi Industry join together they create a super duper hit fusion of success like Rowdy Rathor, Wanted, Gajni, Bombay, so many to name it. 12 : Your favorite Actor. In Hollywood Denzel Washington, Tom Cruise, Tom Hanks and in Hindi Industry Amitabh Bachchan, Amir Khan, Salman Khan, Irfan Khan, Shahrukh Khan, Akshay Kumar and Hritik Roshan and in South Industry[Tamil Industry] Surya, Vijay, Rajnikanth [Telugu Industry] Mahesh Babu and Nagaarjun, Chiranjeevi. 13 : Your favorite Actress. In Hollywood Sharon Stone, Julia Roberts, Anne Hathaway, Drew Barrymore, Angelina Jolie. In Hindi Industry Kajol, Kareena Kapoor, Aishwarya Rai Bachchan, Anushka Sharma, Priyanka Chopra.and in South Industry[Tamil & Telugu]Asin, Shreya, Trisa, Bhumika Chawla, Ileana, Genelia. 14 : Your favorite Director. Karan Johar, Farha Khan, Shyam Benegal, Mani Ratnam, Govind Nihalani and Ramesh Sippy. 15 : Your favorite Music Director. 16 : Your favorite Singer. Lata Mangeskar, Celine Dion, Shreya Goshal, Akon, Enrique Iglesias, John Legend. 17: Your favourite Bollywood Song. 18 : Your favorite Movie. Hollywood Basic Instinct, True Romance, Hindi Sadma, Jakham South Don.and Anion…. 19 : Your favorite place. Paris, Hollywood (California), Italy, Kenya, London and my home town Nainital In Uttranchal…..
20 : Your favorite Color. Black , White, Orange ,Green. 21 : Your favorite Drink. Water, pine apple juice and water melon juice. 22 : Your favorite food. Italian and Mexican, lot of salad. Bread Full grain in Indian okra and chapatees. Writer Sidney Sheldon and books “ The God of Small Things” by Arundhati Roy, “Love Beyond Desire” by Rachel Palmer and “The Best Laid Plans” by Sidney Sheldon.